This one tickled me for too long. It became a serious itch and I feel I have to say something. Two weeks ago, Rebecca Calisi Rodríguez and a Working Group of Mothers in Science published an opinion article in the journal PNAS about the challenges of not only being a woman but also being a mother in academia. Specifically, they discuss the problem of attending conferences with young children. They give straightforward solutions on ‘How to tackle the childcare-conference conundrum’. I would like to point out that this is a fantastic piece and it should be read by everyone. Admitting weaknesses and exposing yourself as a mother can be very risky in a competitive environment. It makes you vulnerable and nobody wants to be vulnerable when your career is at stake. Background of the paper is the fact that many mothers with young kids don’t participate in conferences because they struggle to find care for their children. As a solution, they describe four concrete suggestions they call CARE (for Childcare, Accommodate families, Resources, Establish social networks). After I read this article and the accompanying blog in The Scientific American , I was left with an awkward feeling that would not go away. It has been several days now and it developed into a verbalized statement. Here is where I see the problem with parenting in academia. My view is written from the postdoc perspective. I wish academia would be a place for everyone, however, at my stage it is only a future for a few of us. Caring for a partner and children takes away time. Valuable time that we would otherwise invest into doing more research and other academic engagements. I briefly summarize what Calisi et al. recommend in their paper: First of all, an event should offer affordable childcare. Either at home or at the conference. This can be a childcare center with professionals at the event or just monetary contributions to pay for a nanny (at home or at the event; a friend, a family member or a professional). Second, they suggest organizing the timing of conferences more family-friendly (accommodate families). This means avoiding weekends or school holidays when it is difficult for parents to find full-time childcare. On a personal note, my partner would jump in on weekends and during school holidays to watch our kids. Number one: I believe that caring for your own children, sacrificing part of your career, and feeling pain and unprecedented emotions is not a gender issue. As Barack Obama phrased it in a recent interview (check it out; I am still covered with goosebumps): “Having children feels like carrying your heart outside of your body. Once you had a child you lost your heart forever and you are constantly concerned about it.” I find it destructive to assume that women care more about their progeny than men. It is true that only people with an uterus can give birth and have to go through physical pain and hurtful transformations of the body. It is mostly people with female secondary sexual characteristics who lactate and nurture their offspring on average during the first 9 months after birth (recommended by WHO). However, whenever the child starts eating solid food there is absolutely no reason for the mother to be the primary caregiver. Moreover, many fathers share the pain of giving birth and recovering from the birth wounds with their partners, and the majority of men supports their lactating partners. I also want to mention adopted children whose primary caregiver can be of any gender. Parenthood does not only consist of giving birth and lactating. This is just the beginning of it. It grows more intensive with every year until weaning and fathers are an essential part of it. 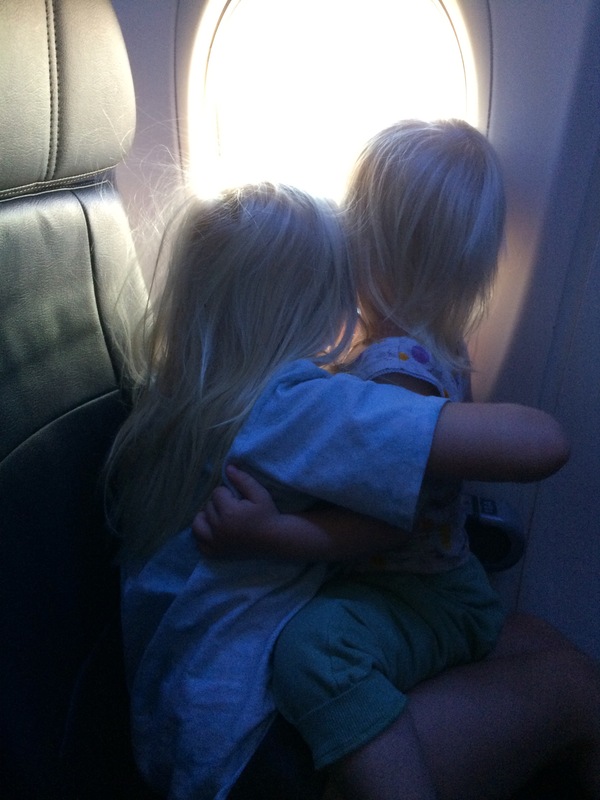 It also gets more chaotic and unpredictable when there is more than one child. Providing comfortable lactation rooms at conferences does not make parenting easier and it would not motivate me to attend a conference. During the whole childhood, breastfeeding is only a small portion of a child’s development. I would be more motivated to go to a conference if I knew that my children were welcome and if I knew they would be cared for. Number two: The challenges that parents face are not specific to academia but here we might have the means to create a more family-friendly environment. All people who pursue an ambitious career encounter difficulties once they start establishing a family. Time is limited. In the private sector it might even be more difficult to advance and take time for your family. For example, you are most probably not going to be promoted if you leave the office regularly early to pick up your children from school, or if you stay at home with a sick child, or if you arrive late because you just fixed a major family emergency. I believe that academia gives us parents more freedom to balance family and career than any other sector. We can make up our own schedules for most of the time and working hours are pretty flexible as long as the job gets done. I urge all parents in the scientific community to support their parent colleagues. It is in our hands to create a family-friendly environment. I want to emphasize what Calisi et al. point out: It is us who can create a family-friendly environment. Nobody will do it for us. We have to do the first step and it might not help us directly, but it will benefit the next generation of the scientific community. Although I have much less time since I have a family, I am generally happier. Having a happy personal life (including children and a partner) can directly benefit productivity (Evans, Bira, Gastelum, Weiss, & Vanderford, 2018). I find it extremely important that we take care of our personal life. This can be facilitated by a family-friendly working environment which would reduce feelings of anxiety and depression. These negative feelings are commonly experienced by early career scientists. I see the real problem in the inequality of salaries between men and women. Currently, men still earn significantly more than women which does not give men much incentive to work less and let their female partners work more (gender gaps in salary are for example reported here and here). It simply does not make sense if the consequence is a cut in the household salary. I am convinced many fathers would otherwise share parental duties with their partners and it would be easier to overcome social pressures. And right here I see one of the major problems that is specific to academia – it seems to be impossible to work part-time, especially for men. This is a striking phenomenon. Why do professors not share their jobs? Why is there no more cooperation? I started believing that this is due to competition. To make it as a professor, to get tenure, you need to develop some particular skills to survive. These skills seem to purge any residual cooperation. The only exception is professor couples, usually led by the male who becomes the professor and the female who gets a job in his lab. I hope somebody can prove me wrong and explain to me why shared professorships (especially between non-couples) are almost non-existent. Another finance-related issue is parental leave. Mothers and fathers should be entitled to a sufficient amount of paid parental leave which is lacking in this country. Thanks Rebecca Calisi for talking openly about your pains, difficulties and dark times that came with the children. It is important to share what we go through. If all women open up like this, it might lead to political change. Statistic of average parental leave time for different developed countries. The figure was published in September 2016 and was taken from here. Finally, I would like to point out a few difficulties of postdoctoral researcher parents – the neglected community at many universities. I call postdoctoral researchers the neglected community because postdocs often get forgotten between the large body of students and the very important community of faculty. With the students it is the shear number that counts and the fact that they pay high fees that support the university. In return they are entitled to many benefits. The professors represent the scientific excellence and need to be treated with special care. As a postdoctoral researcher you don’t qualify for any of the above. You neither get an especially nice treatment nor anything on discount anymore. With discounts I am thinking of public transport, health care, recreational sport or fitness on campus, student housing, or cheap meals. The salaries are higher than for graduate students but not sufficient to support a family. Alas, the age of the average postdoctoral researcher coincides with a peak in reproduction and many postdocs start establishing a family and some form of deep bonds with their partners. Doesn’t it reflect a quality of an individual that he or she successfully attracted a partner and kept him around? I believe we should reward this quality or at least not select against. What we often forget is that the postdocs of today are the professors of tomorrow. If we lose the family-friendly ones now, who will then defend a family-friendly environment? 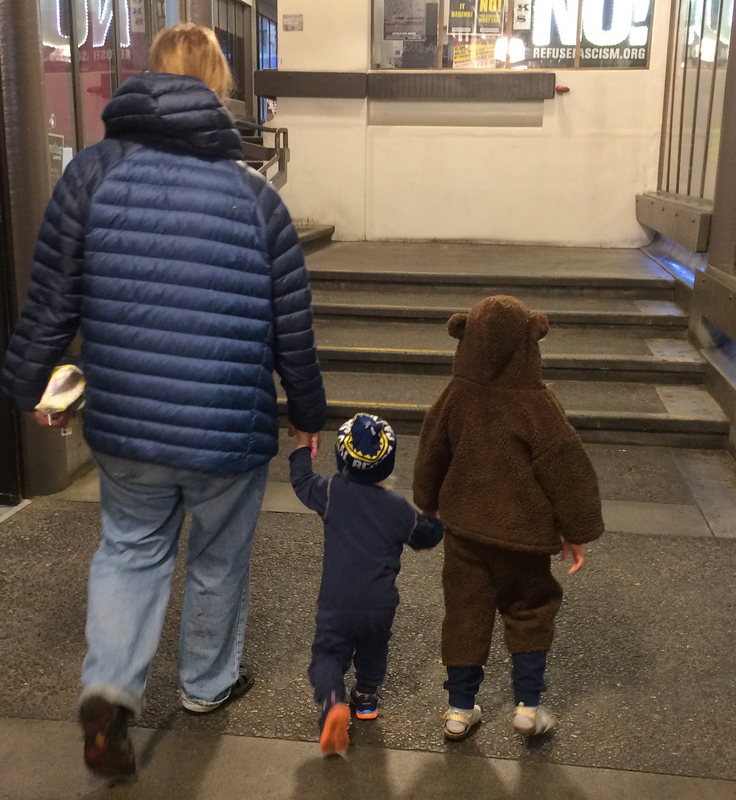 Bear postdoc family going to a Cal women’s basketball game (the affordable option). What are the gender gaps in sports scholarships at universities? What is a postdoc family? UC Berkeley, where I am currently hired as a postdoctoral researcher, attracts researchers and their families from all over the world. More than 70% of the postdoctoral community comes from outside the US. These researchers have diverse backgrounds, cultures and identities. Most of them are accompanied by their partners and/or children. The partners often feel isolated and have a hard time finding a job in the Bay area. Postdoctoral families might be stressed out by the new language, cultural differences, unfamiliar foods, a complicated health system, concerns about the American school system, non-affordable childcare, and a loss of their supporting community and extended family. You might think tough luck! It is part of the natural filtration system to only select for the best and toughest researchers to advance in academia. I however believe that anything that adds to stress outside the lab immediately also affects quality of life and productivity inside the lab. Therefore, I make a call and say tolerate mothers and fathers who don’t only invest in their personal career but also in their family life. They might be the better leaders. Moms and dads, make Calisi et al. your role models and start talking about your challenges! Find each other and overcome shared challenges on social platforms. Organize meetings, social events and workshops to find solutions together with your fellows. 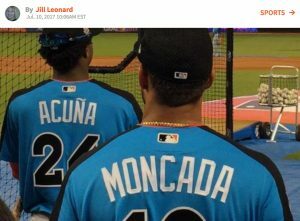 Postdoc parent life is a very different ball game (wonderful blog comparing postdocs to minor league baseball players). So; play fair, cooperate more, and enjoy every single game you get called up to the plate. 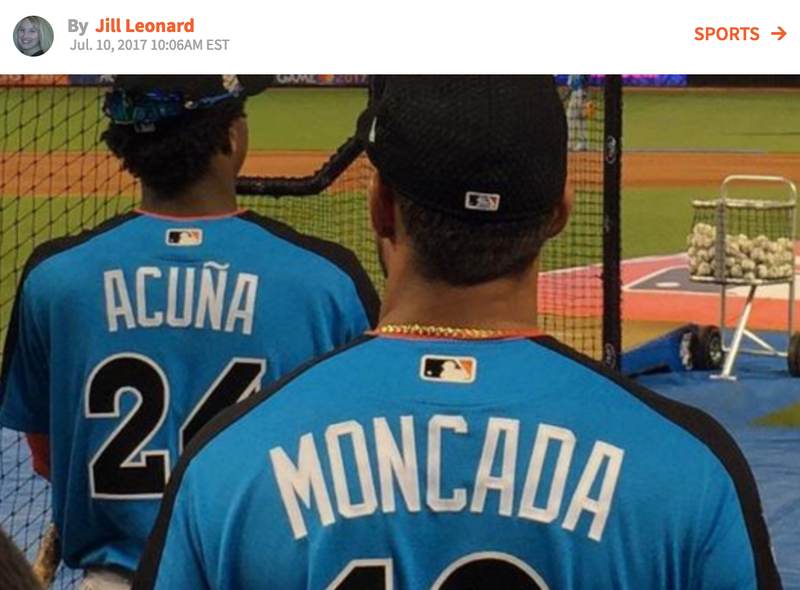 Two minor leaguers with unintentional resemblance to a Disney tune… Picture taken from sports news site. And a special thanks goes out to @peixotors for encouraging me to pull this through and for giving valuable comments on an earlier version of the post. This entry was posted in blogging, career, community, conferences, politics, primates, United States and tagged academia, conferences, family, Homo sapiens, parenting. Bookmark the permalink.